Employers at every level – from Fortune 500s to SMBs – are struggling to find skilled candidates to fill positions and add value to their enterprise. In a job market that is becoming increasingly competitive for great candidates, HR needs to go beyond job board advertising to attract the best talent. Employer brand development and awareness is becoming increasingly valuable in the competition for talent. So who better to look for tips on using employer branding to attract candidates than the marketing department? Branding isn’t about design and messaging alone. It’s about the external perception of your business. It exists whether you’re actively controlling your brand or not. And it’s also about the bottom line. A survey of more than 4,700 talent acquisition decision makers revealed that a strong employer brand results in a 50% savings in cost per hire. When the candidate pool knows who you are, what you do, and what your culture is like, the right fit can be hired faster. Social media isn’t just another avenue for posting jobs. Social channels are an excellent place to showcase your employer brand. Show candidates a day in the life of a team member, ask for their opinions on hot industry topics, and answer their questions about working for your company. By putting your company culture on display, you’ll be able to attract talented culture fits in less time. Content marketing shouldn’t stop with the marketing department. From what to expect after applying to a position, to what to wear to an interview with your company, creating useful content can help candidates feel prepared and build their trust. Providing the right resources upfront makes it easier to get the best talent in the door. Analytical marketers monitor which tactics work best to convert prospects to leads, and leads to sales. Your talent acquisition strategy should be no different. Tracking the source of applicants and hires helps HR to allocate resources to the best channels for hires, whether it’s through a referral program, social network, or particular job board. 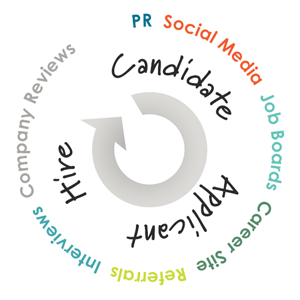 Just like a customer for your product, candidates are in various stages of the buying process. Candidates are all over the spectrum from brand awareness (do they know who you are and what you do? ), to applying to an opening, to accepting a position. Nurture candidate relationships by checking in from time to time. Don’t just share job openings. Share industry news, ask for referrals, or invite them to a company-sponsored event. Checking in with candidates nurtures those relationships, so you can more easily move the needle from “candidate” to “applicant” to “hired!”. Intentionally developing an employer brand, using social media to showcase your culture, providing helpful resources, measuring the results, and nurturing your candidate pipeline are all marketing strategies Human Resources can use to tap into the passive candidate pool.